I wrote this post for Skeptical Science as part of an ongoing series looking at the arguments made by Christopher Monckton against climate science. [T]he global sea ice record shows virtually no change throughout the past 30 years, because the quite rapid loss of Arctic sea ice since the satellites were watching has been matched by a near-equally rapid gain of Antarctic sea ice. However, Monckton is clearly referring to sea ice. 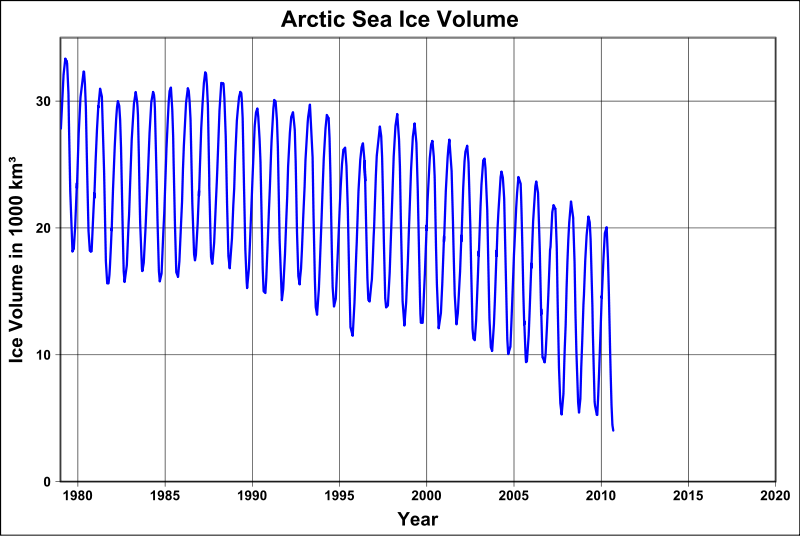 The rapid decline of Arctic sea ice has indeed coincided with an increase in Antarctic sea ice. But do these two opposite trends cancel out as Monckton suggests? 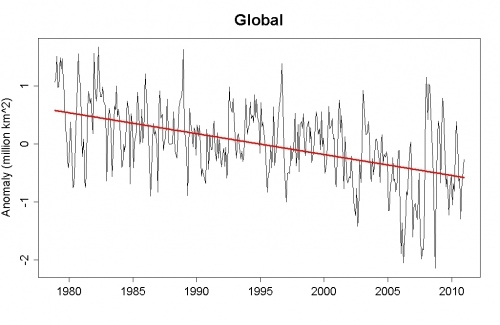 In reality, the upward Antarctic trend is only slight compared to the plummeting Arctic trend. Tamino has crunched the numbers and found the Arctic trend is in fact more than three times faster than the Antarctic one. The net result is a statistically significant global decrease of more than a million km2 – would you agree with Monckton that this is “virtually no change”? Indeed, when the summer extent of Arctic sea ice reached its lowest point in the 30-year record in mid-September 2007, just three weeks later the Antarctic sea [sic] extent reached a 30-year record high. The record low was widely reported; the corresponding record high was almost entirely unreported. Here Monckton is comparing the Arctic summer to the Antarctic winter, not the most appropriate comparison. Sea ice grows and shrinks seasonally because polar latitudes have vastly more daylight hours in summer than in winter. When ice melts, it makes the surface less reflective and amplifies the warming (as is currently occurring in the Arctic), but this effect can only make a difference when the Sun is up. Thus the most important time of year for sea ice is its annual minimum which occurs at the end of the summer: September in the Arctic but February in the Antarctic. Meanwhile there has been a slight increase in Antarctic sea ice volume, but only by about 5,000 km3 (insufficient to offset the Arctic decline shown in figure 3) and most of it in a few years at the start of the record. Then you print graphs of sea ice only. People who believe in AGW always quote Milankovitch cycles to the “deniers” while not heeding it themselves. I’m afraid here Lord, Moncton is is correct on all counts. The Antarctic is gaining sea and sea ice extent. (The latter is statistically minuscule). Global sea levels are dropping these past three years. This Solar maximum is going to be a damp squib which always hikes the global temps a little. This past couple of lifetimes the Sun has seen more activity since the dark ages. Arctic sea ice extent is one standard deviation point below the mean. Summer losses are still higher but winters almost make up for it now. Greenlands ice cap is thickening. Now at an increasing rate. Please do go on. I’m trying to get to the bottom of this and there are so many completely polarized articles on climate. I can’t seem to get any unbiased information.